Lone Survivor For PS3/Vita Arriving in "Two Weeks"
Lone Survivor will launch in Europe on September 25th, with an American release coming two weeks later. 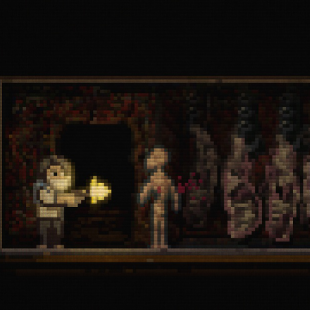 Back in March it was revealed that the sidescrolling survival-horror indie title Lone Survivor was making its way to PS3 and Vita. At the time, there wasn't much revealed in the way of a way release window. That however, is no longer the case. Curve Studios, the developer behind the port, has confirmed that Lone Survivor will be landing on European PS3s and Vitas on September 25th with an American release set to follow sometime in the "next two weeks." In addition to delivering the same mechanics of horror and choice as the original PC version, the Director's Cut edition hitting the Playstation Network will include "hundreds of tweaks" that include new dialogue, items, endings, trophies and secrets. The game will also boast a new lighting system that should optimize its visuals on high definition televisions and Vitas alike. "Lone Survivor: The Director's Cut isn't simply a console port but a completely reworked version of [Jasper Byrne's] original game," commented Jason Perkins, managing director for Curve Digital. The original announcement that Lone Survivor was heading to PlayStation platforms had us pretty stoked. That in mind, you can color us a similar shade of excited now that the game's release is finally rounding the bend. To be sure, Lone Survivor is a great game on PCs but, as with many titles, the prospect of taking it on the go via the Vita is an attractive proposition. Granted, playing it while sipping on a coffee in the middle of a Starbucks will probably draw down the scare factor a bit, but it's a trade-off we're willing to make.